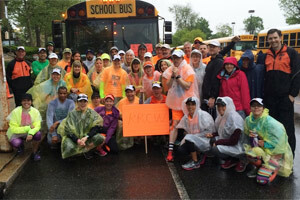 The weather forecast was not looking good days before the 2016 Broad Street Run. We could only hope that the weather people were wrong—this time, unfortunately, they weren’t. All Aboard the Broad Street Bus! The RRCW Broad Street (big yellow school) Bus boards on Colonial Ave around 4:30 am and at 5:00 sharp, we are on the way to Broad Street. Where’s George? 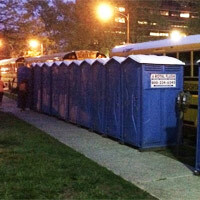 5:30 and we’re parked right up near Broad Street with fresh porta-potties awaiting. Fresh and clean Broad Street Porta-Potties! The bus is a great place to stay dry as the rain is slowly intensifying. We hang out, chat, take our annual group shot in front of the bus and wait. Hey, it’s Coach John Carlson stopping by for a visit! Should I wear my new shoes or old ones? I think I’ll go with the old ones. This is going to be a mess. Finally, it was 7:30 and runners start making their way to the corrals. 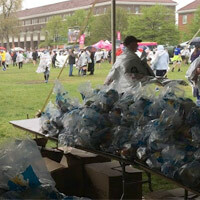 Everyone is ready in their rain gear or ponchos (shout out to Jen and Becky for the great ponchos!). Around 7:50 we hear the National Anthem and the race director’s warning to be careful out there. Then, of course, it’s Bill Conti’s Gonna Fly Now, aka “The Rocky Theme” playing over the loudspeakers. The horn for the elite runners goes off around 8:04 and there’s about a 5-minute gap for each following corral. About 8:15, my purple corral is set loose. And we’re off. The rain is cold and consistent but it didn’t take too long to get warmed up. With the help of my poncho and hat, I’m able to stay fairly comfortable. Jamming along to my tunes, I feel surprisingly good as I sloshed through the puddles. The familiar sights go by on North Broad, the Uptown Theater which had a sign on the marquee “R.I.P Prince,” the mural of Grover Washington Jr. and then the Devine Lorraine Hotel (which is getting renovated). Not seeing too many bands out here this year, I guess the rain has something to do with that. I always turn down my headphones to hear what they’re playing. Around City Hall, the band is playing Bruce Springsteen’s 10th Avenue Freezeout. About a half-mile down the road, there’s another band. It’s 10th Avenue Freezeout again! Popular song with the Broad Street bands, I guess. So now, it’s South Broad and you notice the crowds are growing—there are more “free high-five” signs and cowbell ringers. A multitude of funeral homes and laundromats go by. Six miles down. Or was it seven? I’m hoping seven. There’s the mile marker flag. It’s six. Ok, whatever, I’m in the groove now. It’s all systems go. No need for a water stop today. I’m not thirsty, nothing’s rubbing the wrong way, everything’s just wet (except for my shirt, thanks to the poncho). The rain is coming down even harder with 3 miles to go. Where are the darn stadiums!? The fans are really cheering us on now! I’ll take a rain check on that free high-five. Mile 9 finally! Time to turn it up a little bit. Remember, when you see the gates of the Navy Yard, you’re not done (a mistake that I made at my first BSR). We funnel into the gates and the road gets a bit narrower. There are the ships on the right. There are the cameras on the skylift. Gotta rip open the poncho to show my number and the RRCW logo! There’s the finish line sign up ahead! Alright, let’s kick it in. Bam! I’m done. 1:17 something. Not bad, I’ll take it on a rainy day. Should have worn those new shoes, though! Oh well. Yes, let me have one of those “Philadelphia Marathon” plastic blankets. I guess they had a lot of extras from that race. Nevertheless, it helped patch the hole in my poncho. Ok, this is a selfie worthy situation—snap! The goody bags and field. Now it’s time to find the “W” sign in the field, that’s the RRCW meetup point. Why isn’t my left knee working? I’m lurking around like Frankenstein here. No thank you to the open cups of Gatorade and rain water. Oh yeah, we get a medal! I very unceremoniously receive mine while trying to keep my plastic blanket from blowing away. Thank you very much for the goodie bag! Just what I need, to carry this heavy bag of junk food around in the rain (I know, I didn’ have to take it :)). What are they trying to say here by the way? “Congratulations you just lost 5 pounds by running 10 miles, here’s a bag of cookies and cakes, now go put ’em back on.” Anyway, let me limp over there to the “W” sign. Maria is there checking people in. A few more road runners arrive. Where’s the bus? Same place as last year? Roger that! Let’s take a quick group shot of whoever is here, I gotta get out of this rain. Snap! That’s a good one! Ok, I’m off to the bus. I run into my cousins Harry and Walt who were also on the RRCW team. They’re going my way so I walk with them. It’s a long journey through the Navy Yard, up some slippery grassy hills and underneath Rt. 95 (especially with a bum knee) to South 11th where the bus is parked. It’s in between the Linc and the Wells Fargo Center, right? I get there. No school busses are in sight. Did I get confirmation on the location? Yeah, same place as last year. Cousins leave to go their car. I’m alone now. Well, maybe it was over on the other side on the Linc on Darien St. I hobble over there. No school busses. Ugh! Was it up there near Citizens Bank Park? Can I run again? Yeah, it actually feels better to run than walk. What?! It’s not here either?!! Should I go back to the “W” sign? No, it’s too far! I should have stuck with Vic! I got to call him. No! My battery is dead! “Hey guy, can I borrow your phone?” Wait, I don’t know anyone’s phone number! Argh! I’m lost… I’m lost!! Help! Mommy! The bus is going to leave without me. Wait a minute, there’s a car of die-hard Phillies fans tailgating for the 1:00 game like it’s 2008. “Hey guys, how ’bout those Phils? By the way, do you have a car charger for an iPhone? You do!? Excellent! Hey Vic, where’s the bus?? NovaCare center? Oh, that’s right, we did park there last year.” Whoops! I was thinking of the bus location from 2 years ago. So it was a big thank you to those tailgaters and I was off to the NovaCare parking lot. Yes, there it is! Like a mirage in the desert, it appeared up ahead. The weary traveler has made it. I was never so excited to see that big yellow school bus. George is on the bus! A well-deserved lunch at the Colonial Cafe! 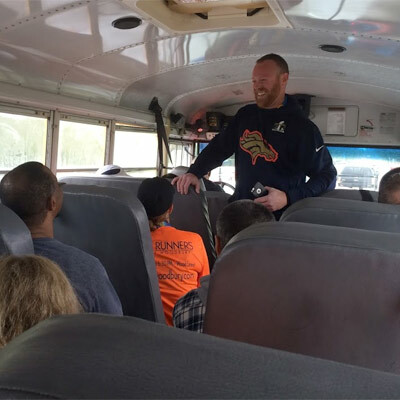 It felt great to be back on the bus and dried off. I thought I was holding up everybody but we still had a half hour until the last people boarded. 11:45 and we were New Jersey bound again. To the Colonial Cafe! We got the whole dining room to ourselves. Good food, folks and fun, that’s the motto at the Colonial. Or was that an old McDonald’s marketing campaign? Whatever, it was a good time as always. One more group photo. 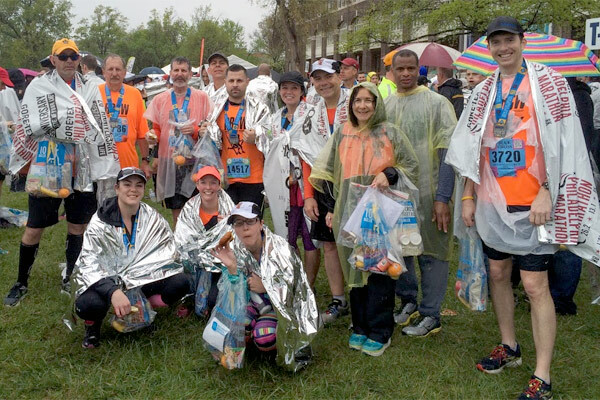 All in all, the 2016 Broad Street Run was fun and definitely memorable. 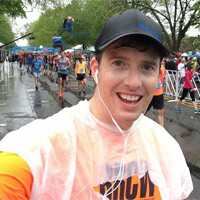 I didn’t really enjoy the thought of running in cold rain before the race, but it wasn’t that bad! 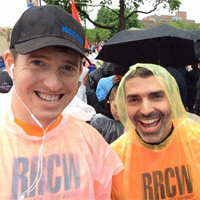 Congratulations to all of our great RRCW Broad Street team runners! You all did great! Check out the team scores from Jim Sery below. Looks like we got a couple trophies coming soon. And a big thanks to Jim Sery who always makes sure that the RRCW teams get into the BSR in the first place (no sweating the lottery system for us)! 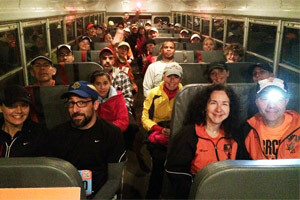 Thanks also to Vic and Maria for organizing the bus and everything that they do. Please leave your memories of the 2016 Broad Street Run in the comments section below. Until next year… And next year, it better be sunny and 65! Congratulations to everyone who ran on Sunday! A miserable day but good performances. Below is a breakdown of the RRCW teams and places. Individuals on teams 1 and 5 should get trophies which typically come in July. Full results of all club teams. Placed 19 with a score of 5:31:49. This was my 4 year running this race. The rain couldn’t lessen my spirits I was excited to run. This was the first year I ran the race with friends along side me. It helped having people there to joke with and get soaked with. Thanks to Jen Becky and Lauren for the ponchos and Maria and Dave for being our cheer squad. And Jim Sery for getting the teams together that is no easy feat. And Vic thanks for being such a great organizer getting the bus each year. Sure, the weather could have been better, but I sincerely think it made it that much more memorable. It was a great day with great people. 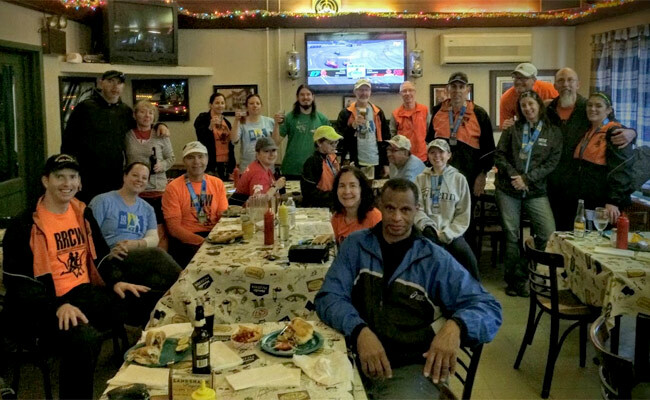 The volunteers were incredible… thanking runners for come out when in reality we needed to thank them for the support in such harsh conditions. The Temple Band made my day… Seeing them is typically one of my highlights of Broad Street and I thought for sure the weather would keep them away. It was definitely a pleasant surprise. All in all, great day! Broad Street means so much to this native Philly girl. I was born on Broad Street! (At Methodist Hospital, not double-parked on the median.) This was my 4th and definitely my most memorable. The camaraderie of the bus, the rain, the Diamond Marching Band (Go TU! ), rounding City Hall, seeing the Navy Yard gates were all highlights. The price of having to deal with 40,000 people is well worth the BSR experience. Many thanks to Vic, Maria, Dave, Jim, my fellow fairies and every member of the RRCW for pulling this all together and making it such a great day!